Like the Miasmos and the Epithal, the Kryos is a specialty industrial ship introduced in the recent Odyssey patch for EVE Online. The Miasmos features a large dedicated bay for hauling ore, the Epithal sports a bay for planetary interaction (PI) commodities, and the Kryos includes a bay for for hauling refined minerals. Ice miners grumbled when they learned that the Kryos would not be able to haul refined ice products, due to technical limitations. But for large-scale miners of asteroids, the Kryos offers a starting dedicated mineral bay of 43,000 cubic meters, which grows to 64,500 cubic meters when Gallente Industrial skill is trained to level V. With maximum skills, a Kryos pilot could carry 6,450,000 units of Tritanium to market. Based on the previous Iteron Mark II hull, the Kryos features the exact same slot layout as the Miasmos and Epithal - 4 low, 4 medium and 2 high. The Kryos also has the same capacitor size as the Epithal, and slightly less powergrid and CPU. When fitting the Kryos, one needs to bear in mind how the ship will be used, which is similar to the other specialty bay industrial models. When you fly the Kryos (or any of the specialty bay industrial models) you are essentially announcing exactly what kind of cargo you are carrying - there's no cargo scan required to figure that out. Therefore, every Kryos pilot needs to think of their ship as one with a big fat target painted on it. Every ganker looking to score 24 million ISK or more in refined minerals is going to find it an attractive target. Therefore, Kryos pilots should fit to make themselves an unappealing target, to the extent that they can. The following fitting provides just over 16K EHP of shield tank, some degree of "slippery-ness" from tacklers, and relatively fast align and warp-out times (though it will never be a speedy ship in that regard). The meta shield extender is required, due to the slightly lower fitting stats on this ship. A variant on this fitting to consider is dropping the Medium Core Defense Field Extender rig, which increases signature radius and thus, makes you easier to target lock, for another agility enhancing rig. Swapping it for a Polycarbon Engine Housing, for example, provides a small improvement in agility and reduces the sig radius from 245 meters to 231 meters - but it also reduces EHP to 14.3K. Personally, I like the extra hit points buffer, but to each their own. You can also swap the nanofiber for a third warp core stabilizer to give you some additional protection against tacklers fit with both a warp disruptor and scram. That reduces your agility a bit, too, adding another second to your warp out time. The prototype cloak is handy if you need to hide out in system. This is especially useful in low sec, if you are brave or silly enough to refine your minerals there. If you are flying this in a wormhole, put a Core Probe Launcher in the empty high slot, just in case you need to find an exit. And don't forget to load scanner probes in the cargo bay! If you are a large scale miner, the Kryos is a handy ship for taking those refined minerals to market, or bringing a hefty load of them to your manufacturing array. I find that I use it for those loads that are too big for the Iteron Mark V (more than 37K cubic meters), but not large enough to warrant undocking a freighter. 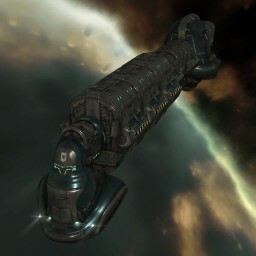 It's a nice addition to the newly revamped line of industrial ships in EVE Online. PS - when researching this post, I discovered that no one - and I mean nobody - spells "Kryos" correctly, including me. Everyone spells it "Kyros". I only realized my error when I tried to find my own Kryos in my hanger, using the search field, and couldn't locate it. After scratching my head, wondering why my ship disappeared, I realized I was spelling it wrong. Then I had to go back and correct several references in past posts. Embarrassing. So, take note, and learn from my mistake: it's spelled K-R-Y-O-S, not K-Y-R-O-S.
Posted in Fitting and tagged with Eve Online, fitting, Kryos, industrials. October 3, 2013 by Neville Smit.